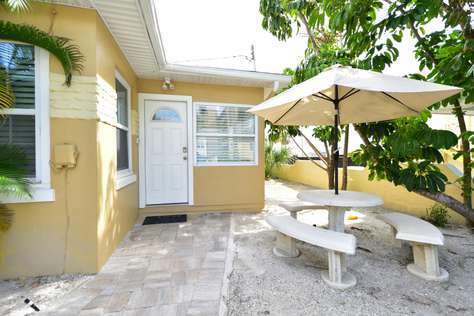 We offer two bedroom beachside cottages in Clearwater Beach, FL. These cottages are ideal for families or small groups of six or less.Book one of our vacation homes today and visit our famous white sand beaches in style and comfort. A perfect place for families, a very safe beach. With outside seating tables by the coconut trees, what better place to relax and enjoy the beach. You're within walking distance to beachside restaurants, Pier 60, shops and other fine restaurants. Many beach sports/activities are available. Take the trolley for a tour of the island and other beach cities. The beach has the largest marina on the west coast of Florida and all sorts of beach activities.